How do I find a partner school? The American high school ideally offers German language classes, but this is not a requirement. In case the German program has been discontinued, or in case German classes are planned to be introduced in the future, schools may apply for a grant if they incorporate a jointly planned teaching project into their exchange visits. How do I change partner schools? School partnerships in GAPP are meant to be long-term (our oldest partnerships have been in place for more than 40 years! ), however, sometimes things don't work out or situations in schools change. If a change is necessary, please remember to let your partner school know about your plans. To look for a new partner you can use the platform on website www.partnerschulnetz.de, where you can set up a profile for your school and look through profiles of schools in Germany. As soon as you've found a new partner school, we ask you to send the application form ( Application to GAPP for New School Partnership / Change of Partner) to our GAPP office in New York. Your German partner needs to file a corresponding form with the Pädagogicher Austauschdienst (PAD). 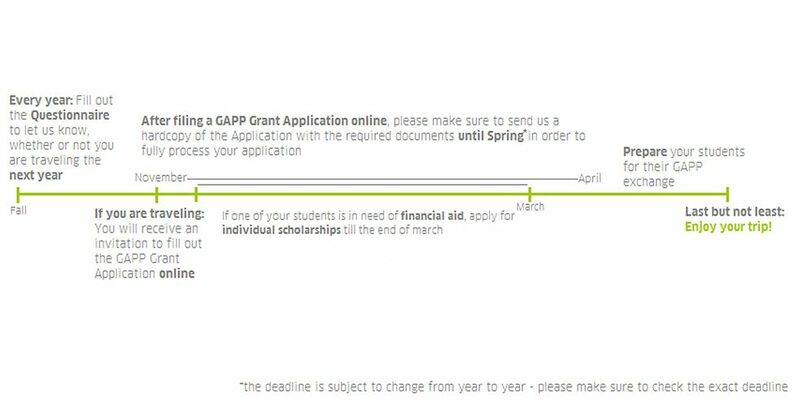 The timeline provides a brief overview of the GAPP application process. The single steps are explained in more detail below. The timeline is oriented on the main traveling season for the schools in summer. If your school travels between January and March or in fall or later, contact us to get further information on when you have to turn in your application. Please submit the questionnaire for the year 2017 by November 1st 2016. Everyone who announced to visit a partner school in Germany in 2017 via the questionnaire, will receive a grant application package and all supplementary information by mid-November 2016. The forms are not available for download on our website. The deadline to turn in the Grant Applications is April 3rd 2017. How much is a GAPP exchange? GAPP's mission is to support schools to make valuable international exchange experiences for all. Aside from the framework for school partnerships, GAPP does offer the opportunity to apply for financial support for group exchanges funded by the German Foreign Ministry and the US State Department (Airfare subsidy for teachers, subsidy for the group per student). 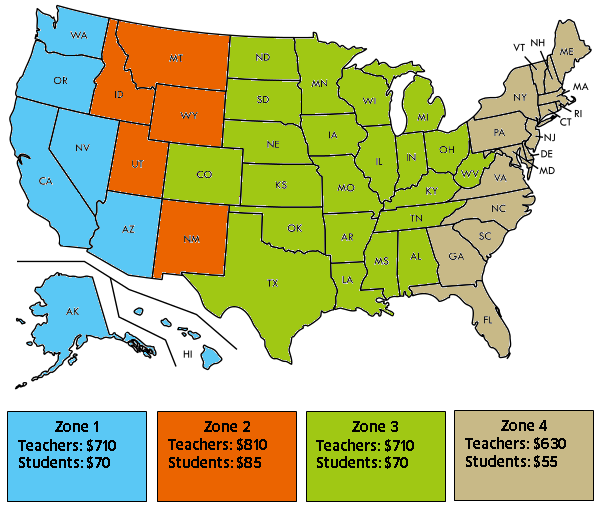 There are also scholarship opportunities for individual students in the US funded by generous donations of private individuals, companies or other institutions. The needs and requirements of GAPP schools and groups vary vastly. Therefore, GAPP does not organize any trips and coordinators and schools are responsible to organize their own trips to best fit the needs of their students and schools. This flexibility allows groups to keep costs as low as possible for their particular group and to include students who otherwise may not be able to participate in international experiences. The main focus of GAPP exchanges is on the academic exchange with home stay, therefore costs for a traditional GAPP exchange consist of the roundtrip to Germany, ground transportation to the partner community, funds for local excursions and pocket money. GAPP Rates are subject to change. Unfortunately, funds are limited and we may not be able to approve all applications, although we work hard to make funds available for as many groups as we can. If the application fulfills all criteria and is handed in within our deadline, we will award funds on a "first-come, first serve" principle. That means, it's worthwhile to turn the application in as soon as possible. If you are traveling later in the year and are afraid you might not have all required information in time, please contact us at gapp@newyork.goethe.org. Which documents do I have to include with the Grant Application? The students participants list needs to be turned in online and be included in the hardcopy of the application. This will not only help us in cases of emergency, but also generate the student's certificates. Therefore it is important to fill out the list in the preformatted excel sheet you find with the online application. Sometimes, the system of your computer does not run with our server and won't upload the excel list. If so, please send us an e-mail with the student's participants list attached. The schedule of your trip needs to be included in the hardcopy. It will help us check if you are within the guidelines of at least 16 days (incl. travel days) and of which at least 10 days are spent in school or with school related activities. Please remember to turn in the final invoice, as soon as possible. Why do I need a topic/project and do I need both? If you need inspiration, a list of this years topics and projects can be found in the download section below. GAPP groups have to have insurance for students and teachers (liability, health & accident) when traveling. Personal liability, health, and accident insurance are mandatory. The GAPP coordinator is responsible to get the group insurance, GAPP does not provide personal liability, health, or accident insurance. However, GAPP provides professional liability and accident insurance for up to two accompanying teachers per group. We can offer this free liability insurance even to groups that do not receive funding in a given year. So it is always worthwhile to hand in your grant application. You will not receive a policy number or separate confirmation from our office or the insurance company. The Professional Liability and Accident Insurance does not include Personal Liability and Health Insurance for the teacher and does not provide travel insurance coverage for your student group. You are free to use any insurance company that best fits your need. Many GAPP teachers choose to use German insurance companies due to lower rates and their familiarity with the German healthcare system. GAPP's mission is to support schools to make valuable international exchange experiences for all. The needs and requirements of GAPP schools and groups vary vastly. Therefore, GAPP does not organize any trips and coordinators and schools are responsible to organize their own trips to best fit the needs of their students and schools. This flexibility allows groups to keep costs as low as possible for their particular group. The main focus of GAPP exchanges is on the academic exchange with home stay, therefore costs for a traditional GAPP exchange consist of the roundtrip to Germany, ground transportation to the partner community, funds for local excursions and pocket money. Nonetheless, we partner with 3 airlines, which offer special group fares for GAPP groups. For details on each airlines offers, go to the Group Exchanges site and click on the airline logos. Of course, you are free to book with any airline that best fits your needs. U.S. citizens do not need to apply for a visa to enter Germany for a GAPP group exchange trip. Upon entering Germany they will be issued a stamp in their passport allowing them to stay within the Schengen Area, which includes Germany, for up to 90 days. U.S. residents with foreign passports may not be able to enter Germany and the Schengen Area without a visa. Please consult the Visa Regulations Overview of the German Ministry of Foreign Affairs (MOFA) for detailed information. If the foreign citizen is a legal U.S. resident and their citizenship requires a visa, they may be eligible to be issued a visa by a German consulate or the embassy in the United States. Please ask the German mission responsible for your state for further information. You can find an overview of German consular jurisdictions in the U.S. here. If one of the travelling students has to obtain a visa, you may refer to the “Schengen Visa – Tourist” factsheet and checklist provided by the German MOFA. Please note that minors applying for a Schengen visa have to meet certain other requirements in order to obtain a visa. Refer to this MOFA fact sheet for a complete list. Please make sure to enroll in the Smart Traveler Safety Program (STEP) from the State Department. It is a free service that conveys your travel information to the U.S. mission closest to your destination. This is a key resource to help the U.S. Diplomatic Missions in Germany reach out to you in case of an emergency. Make sure to have a look at the Traveler’s Checklist provided by the State Department for a short summary of the most important points and useful further links. Are there individual scholarships for committed students? As GAPP coordinators you all know the amazing growth in personality and maturity your students go through in 3 short weeks of exchange; and sometimes there are students you wish you could take along but who simply cannot afford a trip to Europe. This is why we offer individual scholarships for deserving students in need. As many of you know, GAPP, Inc. does have limited funds for students, generously provided by private individuals but also larger institutions. In 2017 we were lucky to receive the generous support of the Max-Kade Foundation, the Joachim-Herz-Stiftung, the American Friends of Bucerius, as well as Lufthansa, many of whom also pledged support for 2018. If you have individual students who are in need of additional financial support, please contact us via phone or email (natascha.lehner@goethe.de) and ask for details. If you want to contribute to the GAPP Scholarship fund, there are various ways to contribute - either via direct donation per check or paypal or through services such as Amazon Smile and Paypal Giving Fund, where these companies make donations without added cost to you. For more information, please click here. As a (future) GAPP-teacher, you also have the possibility to exchange concerns, thoughts or ideas in our GAPP Teacher Forum on facebook.com. If you are interested in joining, please let us know and we will admit you to the group.